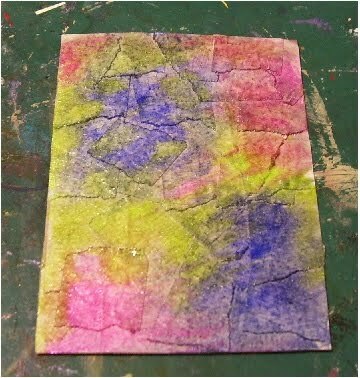 Well I haven't done a tutorial in ages and while my internet was askew I took some pics of a background I like to do for ATC's and inchies. This is probably one of my favourites, it is called faux leather, faux stone and probably a few other names besides. Most supplies you probably already have so let's get started. 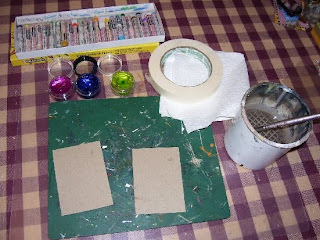 First gather your supplies, masking tape, a work surface, ATC pre cut cards or inchies, I am using Twinkling H20's on one card, oil pastels for another, a tissue or soft cloth, a paintbrush some water and some paper towel for mopping up water from paint brush. 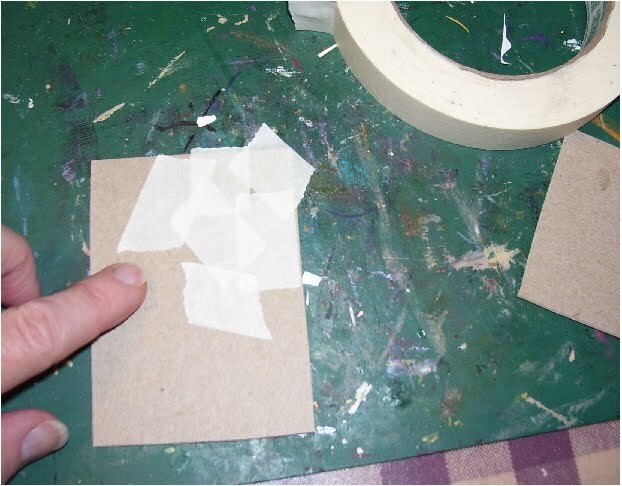 Take your masking tape and start tearing small pieces of it placing in on your card, overlapping and making sure you cover your cards completely. Once the cards are completely covered with tape, take your scissors and trim the overhanging pieces so you now have a nice trimmed edge. you could just wrap the tape around and that is up to you but for ease here I have trimmed them. The first card I am going to add my Twinkling H20 colours, as you know you have to dampen them to get them workable so you can add the water before you start ripping you tape, by then they should be ready to use. 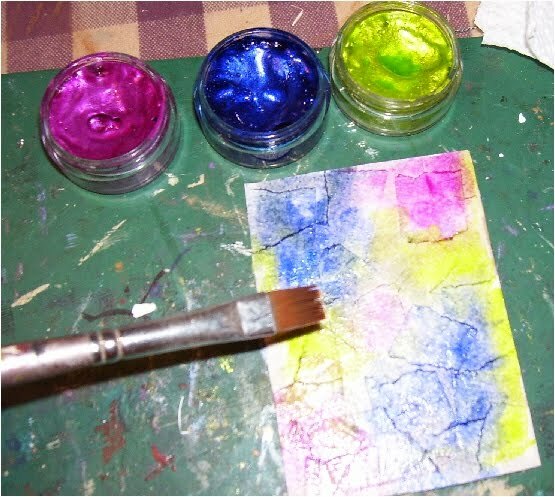 I have chosen 3 colours here, a dark blue, fuscia and a lime green. 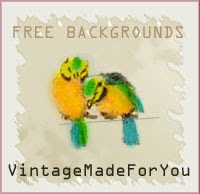 (sorry I don't have the brand colour names in front of me) you can do however many colours as you like. I have more or less plotted the colours down but we will be blending them together to soften the hard edges with the paint brush. Clean your brush often and take the excess water from your brush by just touching the paper towel as you blend between colours. 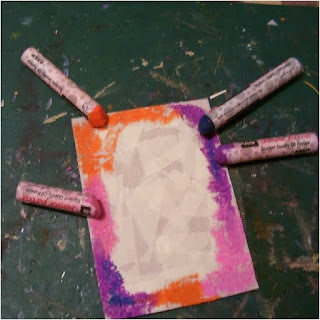 Running the colours too much together will result in a muddy paint colour and we don't want that. 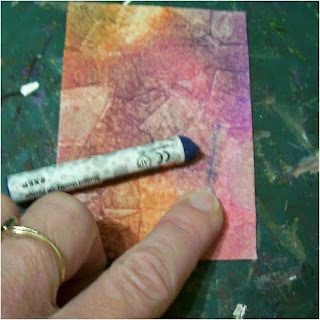 Below is a close up of how the colours are blended. If you are happy with it at this point leave it and let it dry. 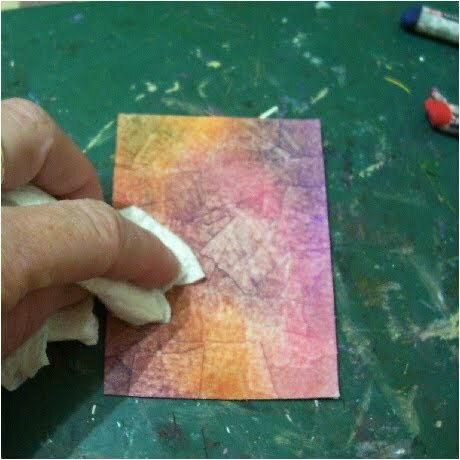 If you want more intense colour, allow the original colours to dry then just spot the colours you want more intense in those areas and gently blend them. colours go into the crevaces of the tape. 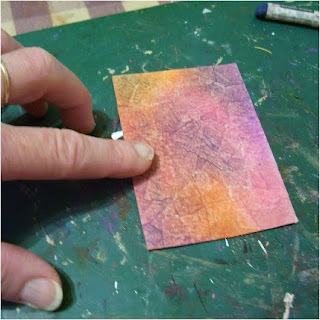 Next we are going to take a piece of tissue or soft cloth and I am going to show you how to hilight some of the areas on your card, this will lift some of the oil pastel but leave a lighter shade. Remember with pastels you can also scratch or scribble into them, this gives for interesting texture and visual interest. Just randomly rub with the tissue here and there, you don't have to do the whole card but areas to give a light effect. And last but not least I add a bit of a dark blue near some of the areas where the cracks from the overlapping tape are to give some depth to the background. It really makes the background pop. 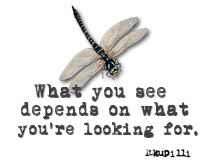 Just add a very thin line of colour along some areas here and there and just blend it a bit with your finger. And that is it. 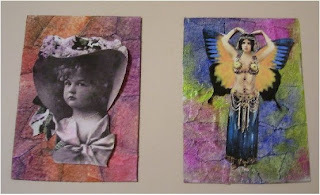 You now have 2 cards with different mediums to use for an ATC. The cards below are examples I have made to show you what your masking tape background can do for you. 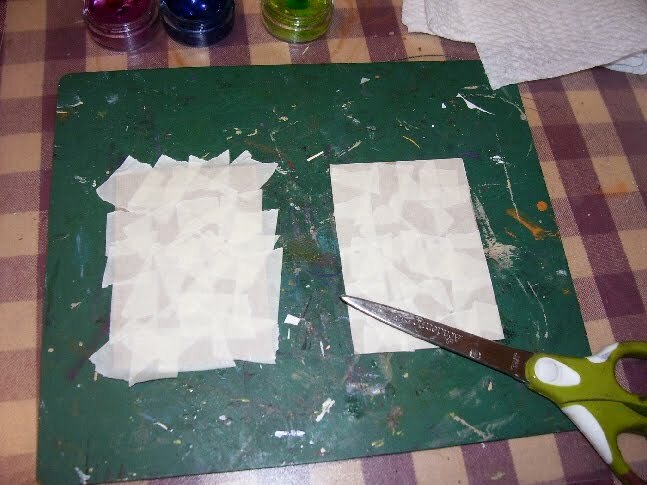 So go rob hubby's workshop or buy your own tape and get arty. oh My, lovely tute les, thank YOU!!! Great job on the tute, Les! Now I just have to figure out where to get Twinkling H2O's.